How close to the moon would a flyby trip likely attempt? For a flyby of the moon, like the SpaceX #dearMoon flight announced September 17, 2018, how close would they likely attempt to pass? Is there an average or optimal trajectory for a lunar flyby used on past missions? 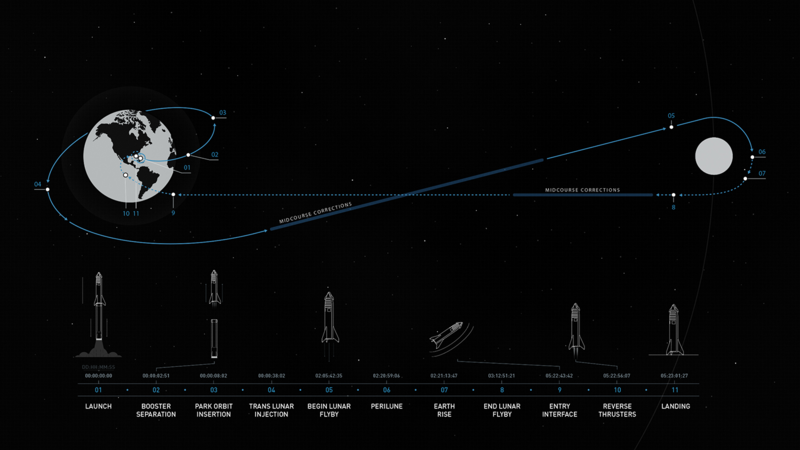 The perilune (closest approach to the moon, number 06 in the graphic) is going to be about 125 miles / 201 km. On May 17, 2018 NASA's TESS passed within 8,253.54 km of the lunar surface on a flyby. This is roughly equivelant to 2% of the distance between Earth and the Moon. Not the answer you're looking for? Browse other questions tagged the-moon flyby or ask your own question. How does Exploration Mission 1 orbit differ from Apollo-era free-return? How far from Earth (and Moon) does it go? Any news of TESS' lunar flyby; how well did go? Could Earth-lunar flybys be repeated consecutively without the use of propellant? What is the marginal cost of *landing* on the Moon? How close to a planet can a flyby manoeuvre realistically take place before air resistance becomes a problem? How much mass could the Saturn V rockets have landed on the Moon if nothing was coming back? What is the closest fly-by of a planet/moon ever completed? How soon after “The Eagle” landed did they first attempt to bounce a laser off the Moon? When did it first succeed? Was this the first-ever photo of a full moon very close to lunar new year?